It’s been 4 months since I “finished” making Ann-Marie. But there have been a few things missing. The argument over the pickup is a controversial one for guitar makers. 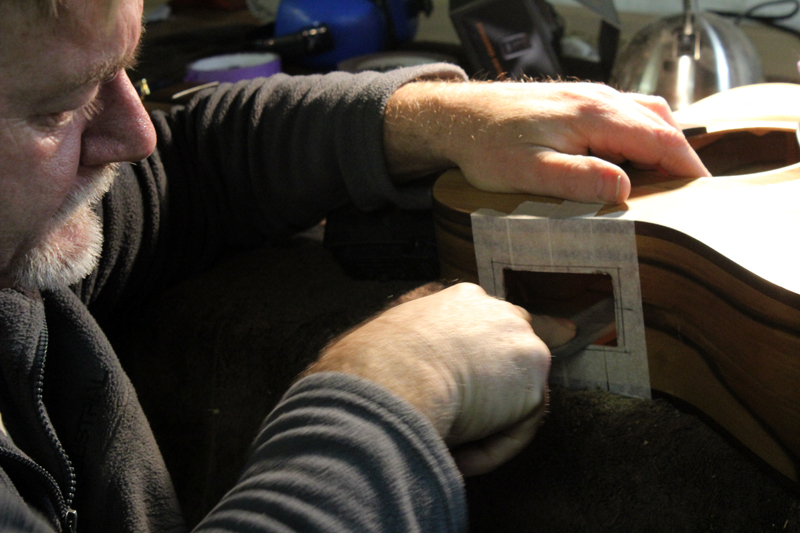 Chris Wynne, the wonderful luthier who guided me through the guitar-making process, doesn’t like putting pickups in, as I’m sure it would be hard to make such a beautiful instrument with gorgeous wood, then go and cut a huge hole through the side of the guitar. But for this guitar to be most suitable for my playing needs, it has to be able to be played live. I don’t enjoy whacking a mic in front of a guitar, as it means I can’t move around on stage. I’ve had this guitar for 4 months (pickup free). I’ve played it at some very special occasions on my east coast tour, acoustically, with no PA or amplification. It’s been a grounding experience, to bring it down to the roots and take away all amplification, one that seems to draw an audience in to the most intimate of moments. But alas, there are gigs in larger rooms with larger audiences that cry for an amplified guitar. My first choice was a Takamine Cool Tube preamp. I LOVE the preamp in my Takamine guitar (it’s the version without the Cool Tube). I love its 3 band EQ, inbuilt chromatic tuner, it’s crystal clear sound that just seems to highlight the most tasteful frequencies. 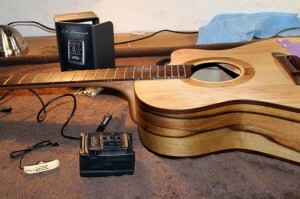 I decided on the L.R.Baggs Anthem preamp and pickup. It’s a dual source. 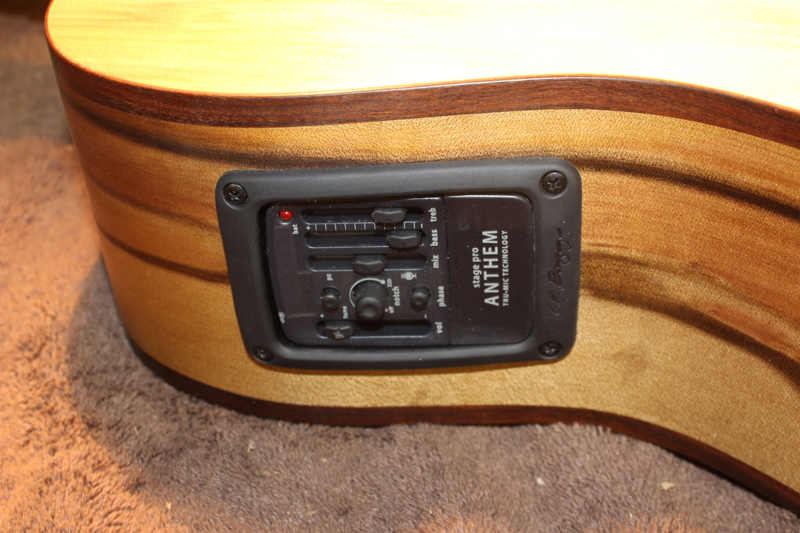 It comes with a pickup you position under the saddle, AND a mic you place inside the guitar. You can create a blend of the two inputs. Personally I like more piezzo sound than mic, but it’s nice to add a li’l colour with a touch of mic. 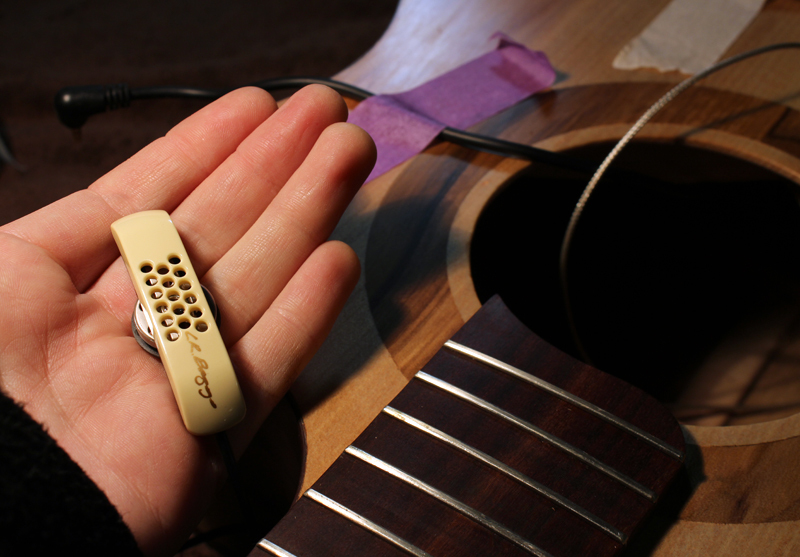 It also comes with an inbuilt tuner – very essential for shifting between my alternate tunings on stage. L.R. Baggs kindly supplied me with everything I needed. 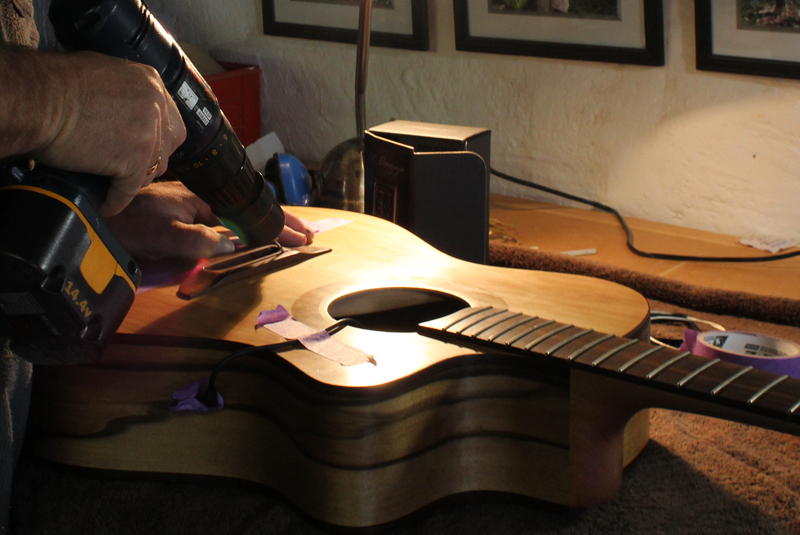 It’s painful watching your guitar go under the knife (or drill, should I say). It’s a brutal surgery…. Thankfully this is a two in one end pin – it functions as a strap holder and a jack for the lead. 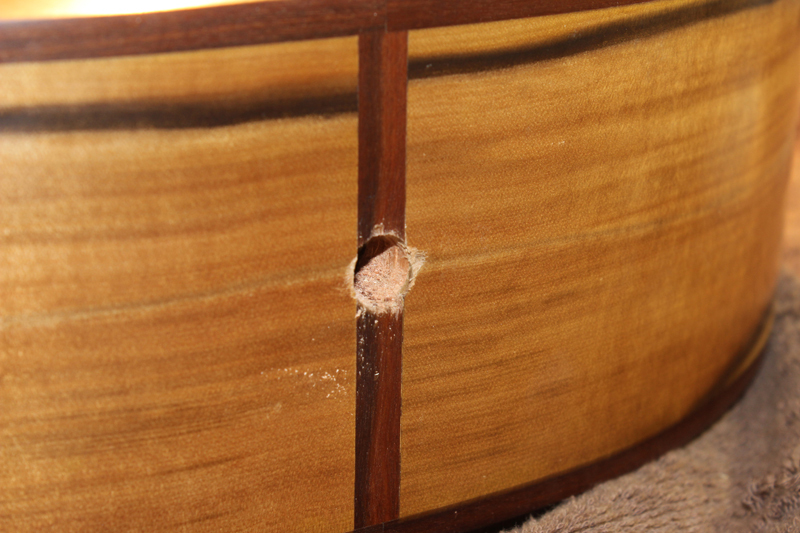 So there’s only one whole to drill at the back of the guitar. Chris taped a piece of scrap wood to the outside to avoid fraying the edges while drilling. He started off drilling a pin prick hole through the bottom of the guitar. He gradually changed drill pieces, increasing the size till it reached 12.5mm wide. The incremental procedure also helps avoid fray. 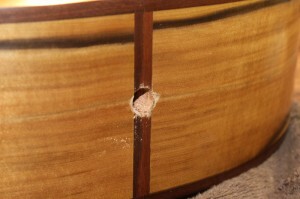 But despite all care, some of the sides of the wood were eaten away by the drill and the wood frayed. I suppose the rock hard gidgee binding was challenging to get through. AHH!!!!!! Thankfully this will be covered up by the end pin…. thankfully. So no repairs needed. 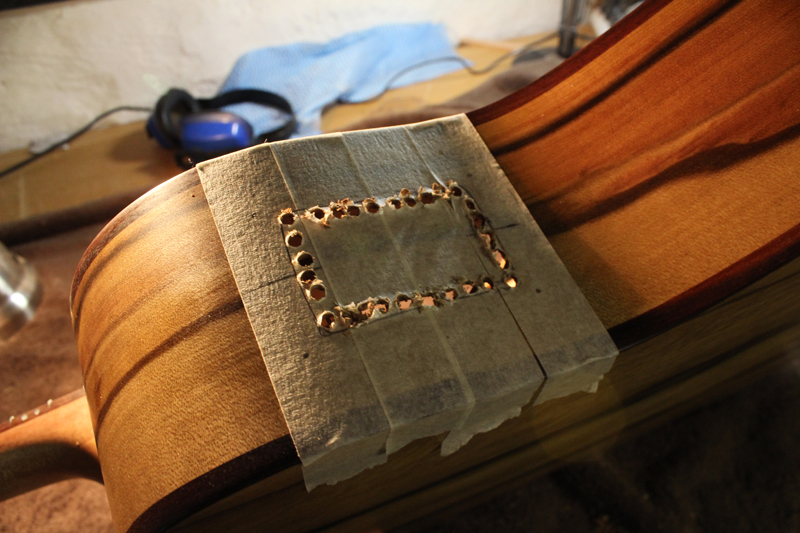 A hole is drilled on a 45 degree angle (so the pickup wire isn’t bent) through the bridge under the saddle, through the guitar. Weave the wire right on through. 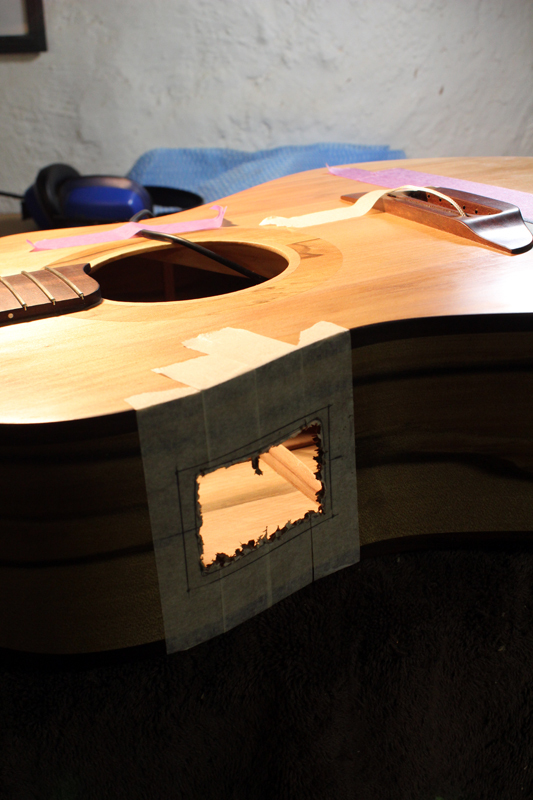 I had to sand off 1.5mm off the height of the saddle to cater for the pickup that now sits under the saddle. The action will need to be checked again before playing! As this is a dual source preamp, the second input is a mic. 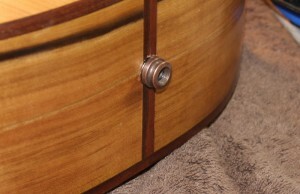 The mic is simply stuck to the bridge plate inside of the guitar, on the soundboard, under where the bridge is positioned. OH!!!! My poor guitar! I was advised to go home rather than watch in anxiety at the brutality that is carried out during the installation of a preamp. But alas, it’s an interesting ordeal. I first measured up the position of the preamp. You need to find the “flattest” part on the side to put the preamp. Awkward fitting a flat box onto a curved surface. Chris drilled 4mm holes into four corners of the area you are going to cut out. Then drill many holes in a line to join these four dots and create a box, which is then cut out using a saw. It sure looks ugly! 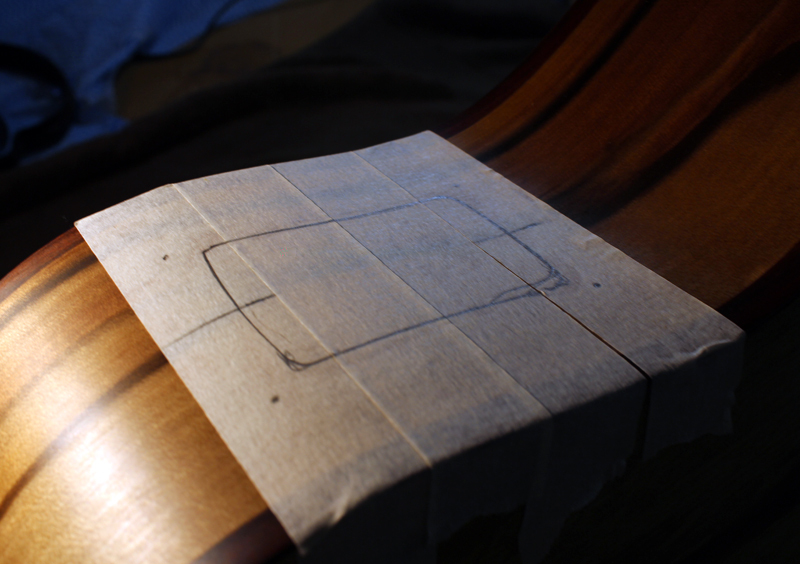 This is then filed to size, the edges are smoothened, and the preamp is positioned into the hole. 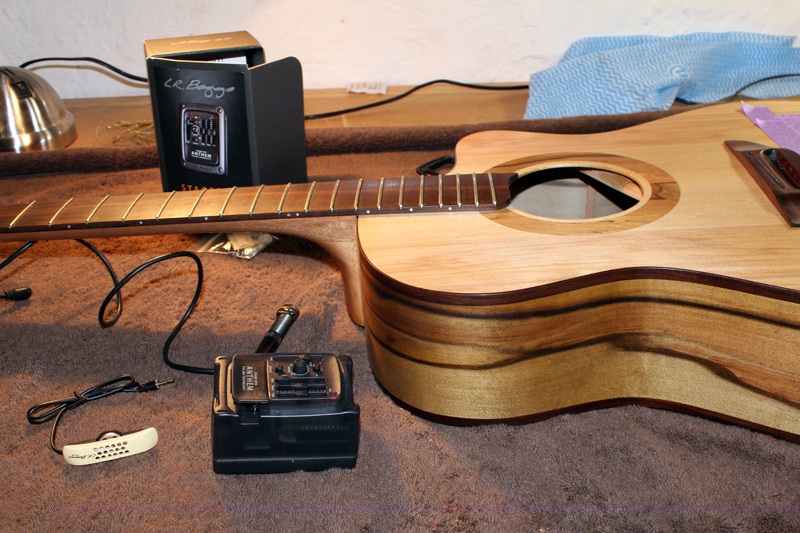 Apart from some initial challenges getting the preamp installed (refitting, stuck battery box, wobbly jack pin) the guitar sounds amazing. I think it will take some getting used to, knowing which setting I like best, and what work best for different PA systems and rooms. But I’m pretty stoked! I can’t wait to start performing with this guitar. Ann Marie is her name (named after my mother). BRAND NEW ALBUM: This October I will be recording a BRAND NEW STUDIO ALBUM! I can’t wait to use Ann Marie on a few tracks! She’s got great BASS and depth, but also a very bright, sparkly treble, for all the fiddling bits. I’m currently raising money through Pozible (a crowdfunding platform) for the making of the new studio album . The support has been amazing so far, and the power of people will get it happening. If you would like to support this project, click below. Your investment makes all the difference! Bring the music to the people! 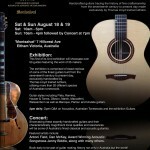 GUITAR EXHIBITION: But BEFORE then, this August Ann Marie will be featuring in an exhibition: Beyond the Trees. The exhibition will be at Montsalvat where I created the guitar, along with over 50 hand made guitars from 25 training luthiers. CLICK HERE to read more about the exhibition. Ann Marie is the only Classical Acoustic (template by Chris Wynne) guitar in the exhibition. It’s a small body with a cutaway, pinless bridge, and now has a PICKUP!!!! 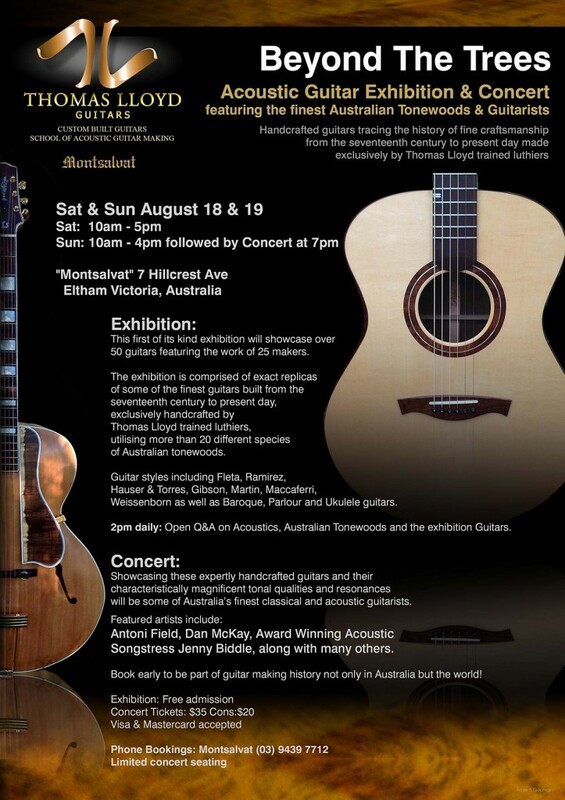 Mind you, there will be some pretty stunning guitars at the exhibition, including a double neck guitar, and a slide guitar made from Blackwood from Marysville’s Black Saturday Bushfires. I can’t wait. I will also be performing Ann Marie in the celebratory concert. Details below! Phone Bookings: Montsalvat: (03) 9439 7712. You sound like a poet, Ms. Biddle. Your harrowing tale is funny. I checked out YouTube. I really enjoyed “Hero In Me”.